Update on this Brownie... I was fortunate enough to score this little gem. Eric the seller was great. Craigslist is always a hit / miss. I was not expecting him to keep me in mind to hold it for day til I could pick it up. He did say he was offered more for it even after he let them know a sale was pending. This is in some rough shape but equipped with all the bells and whistles for the era. Now, after reading the posts here I will be honest. I was only going after this one for parts. @JEBIV I see you have more interest in this gem as a whole complete grill. It is rough I will post some pics. contact me after reviewing them and if you are still interested we will work out how I can get this to you. The handles are in really good shape just weathered. the bowl and lid have several heat cracks and chips. the welded handle is strong but slightly bent and chipped from the bend as you can see in one pic. the ash pan assembly is completely frozen. most of the mechanicals can be cleaned up and reused or replace rather simply. I think the bowl chips and cracks just add character to the age of this Cadillac of grills. Damn! I’m late to this one. Been looking for a brown MT/OT+. Hadn’t seen any made after 1991 before today. Very nice! Ok, so if I read through this thread right Member A posts it because it's too far from him. Member B asks if anyone can agent. Member C expresses interest in the grill, but Member A has changed his mind and is buying it. 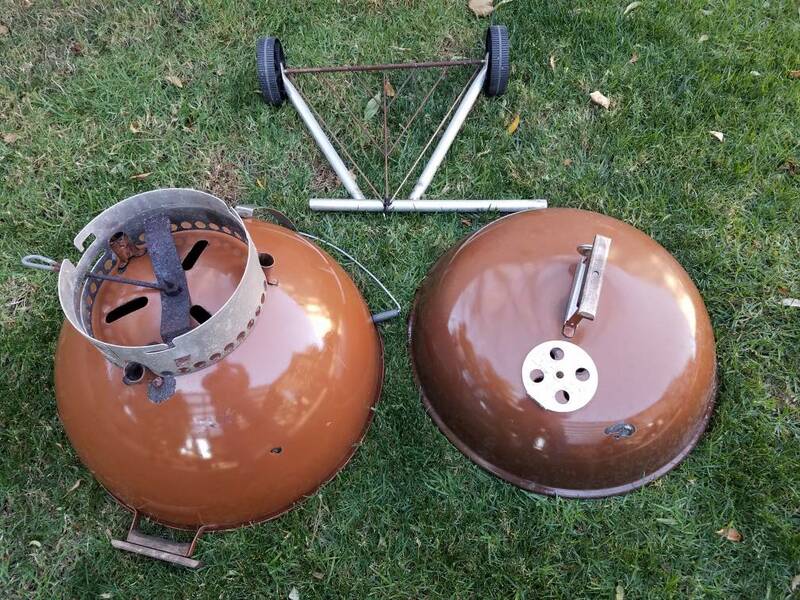 Member A ends up with the grill then decides to give it to Member C in total disregard of the fact that Member B expressed serious interest and collects that exact grill. Seems pretty damn shady to me! I'm sure it'll all get worked out. Let's not bring any unnecessary drama to the post, eh? Edited my previous post since I am catching all kinds of flack. Will just let Kettle Karma take the wheel from here. Fair enough. You never know what private discussions occurred outside of this thread to it may have been the right deal the way it went down so I may have been way out of line. In as much as I would love to add this kettle to my collection the I am happy it is at least going to a club member. ... subsequently I hope my sarcasm is clearly heard. Sarcastic font, I can see it on the next iPhone already.